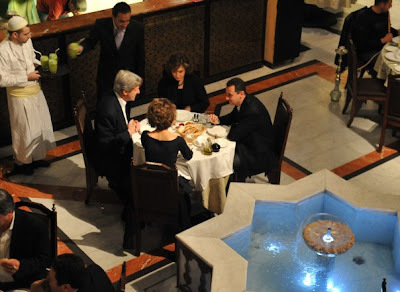 "friday-lunch-club": Senior US Official: "Assad probably has the wherewithal to be sitting in the palace for quite some time,"
Senior US Official: "Assad probably has the wherewithal to be sitting in the palace for quite some time,"
"He probably has the wherewithal to be sitting in the palace for quite some time," said a senior administration official. In the second half of last year, Mr. Kerry began shuttling between the Syrians and the Israelis, according to people briefed on the diplomacy. The senator believed the talks were progressing so well that last fall he and Mr. Assad's aides secretly drafted terms they hoped would allow for the resumption of direct Israeli-Syrian peace talks, according to people familiar with their work. The plan: Israelis would agree to resume talks and commit to returning all Syrian lands seized during the 1967 Six Day War. Mr. Assad would pledge to distance himself from Iran and Hezbollah.... This January, however, the U.S. diplomatic pursuit of Damascus began to fray. American officials and French President Nicolas Sarkozy had pressed Mr. Assad to help stabilize Lebanon. But that month, Hezbollah and Syria's other Lebanese allies engineered the ouster of Prime Minister Saad Hariri, a close Western ally. Mr. Kerry was booked into Damascus's Four Seasons Hotel in anticipation of his seventh meeting with the Syrian leader. But days before the senator's trip, the White House and French government intervened to block the meeting, according to U.S. and European officials. They didn't want to give Syria's strongman the stamp of approval that a visit from the powerful senator would imply...."